There are plenty of myths about bridesmaids, but for every movie-worthy tale of absurdities, I’m willing to bet there are hundreds, if not thousands, that tell the real story. Bridesmaids are a bride’s closest friends, and often closest family, who enjoy helping her plan for the big day without the drama (or at least, not much). These are the women (and sometimes men) a bride turns to not just for assistance and advice, but also to share the fun times in her daily life – that’s what makes them so well-suited to be her wedding team as she prepares to get married. While there might be some tense moments here and there throughout the process (we are talking about planning a wedding after all! ), most trouble can be avoided with a little knowledge about what’s expected of whom – and what’s not. Some brides know long before their engagement just who their bridesmaids will be, while others don’t. There is no magic number of attendants, and some brides opt for only a maid of honor, or even none at all. There is also no requirement for an equal amount of bridesmaids and groomsmen, though usually the numbers aren’t too far apart. It’s also fine to ask close male friends to be what’s called an honor attendant (e.g., the bride’s brothers are typically invited to be groomsmen if they are included in the wedding party). In turn, consider asking your fiancé(e)’s sister to be a bridesmaid. Even if you don’t know her well yet, or haven’t always gotten along in the past, this is a great opportunity to change that and set the stage for her to be your sister-in-law. There are some misconceptions about the responsibilities of a bridesmaid. In short, they pay for their dresses, shoes, and accessories, as well as for their transportation to the wedding if they don’t live nearby. They help out in general, both before and at the celebration; arrive on time for the rehearsal, rehearsal dinner, and ceremony; and participate in wedding photos. In turn, their accommodations are traditionally taken care of by the couple (either hotel or a stay with family friends). And what about hosting a bridal shower or bachelorette party? While attendants often want to and, as close friends, make for good candidates to host one of these events, it’s not actually a requirement. Neither is promising to refrain from new haircuts, tans, or other changes to appearance. When you ask, be sure not to assume a “yes.” Give your friends a chance to think it over. Be understanding if anyone turns you down – it’s most likely because of financial or time concerns, not you. There’s no doubt that bridesmaid frocks have earned a reputation, and not a good one. It’s hard enough for one person to decide what to wear to a special event, let alone figure out what will work for several women with varied budgets, styles, and physiques. Luckily, the sky is the limit when it comes to options. 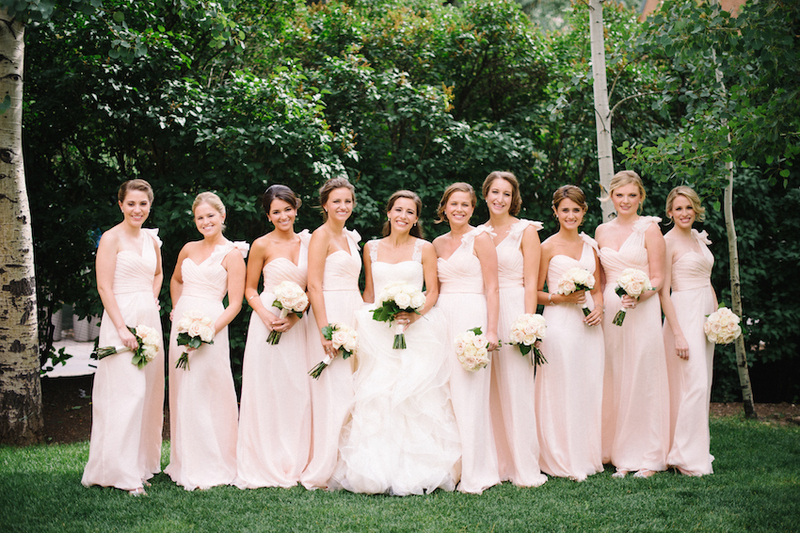 Picking similar, but not matching, dresses is the most popular solution – my own bridesmaids all wore shades of pale pink, but in various silhouettes from different companies. The resulting range of hues and cuts provided both cohesion and personality. Because cost is a consideration, discuss a price range everyone would be comfortable with, and then start looking. If you love a gown that’s outside the budget, the only alternative is to be willing to make up the difference yourself. Committing to being a bridesmaid is a big deal. While it doesn’t mean being at the bride’s beck and call 24/7, it does involve being present and helpful at key events. Sure, a bridesmaid’s life could get busy or other circumstances in her life could make attending the wedding inconvenient, but this is one commitment to honor. Changes in finances might mean bowing out, but a conversation with the bride is in order first. It’s entirely possible she has the resources and desire to cover those costs, in which case, problem solved. If not, brides should be gracious in disappointment – money can’t appear out of thin air. Ultimately, illness and family emergencies are the only other reasons a bridesmaid should cancel. There’s no requirement for bridesmaids to give a present to the bride beyond being part of her big day and a guest, though some opt to offer a group gift. It’s also nice for the bride to consider waiving a wedding gift, citing, “Your presence is your present.” This is especially courteous when the costs might be high, such as at a destination wedding. In turn, it’s also thoughtful for the bride to think about bestowing her bridesmaids with thank-you tokens for their time and efforts. These are often jewelry, accessories, or mementos, such as picture frames, canvas bags, or other items that could be engraved or monogrammed. Lastly, the most important thing to remember is to have fun – and that the best kind of fun is the kind that isn’t mandatory. As a bride, my policy was to include and ask, but never to demand any of my bridesmaids do a task or organize an event. From dress fittings to cake tastings and bachelorette drinks to helping write place cards, my ladies joined when they could and wished me well when they couldn’t. That two-way exchange is what makes them great friends, and terrific bridesmaids. So here’s a very public thank you, ladies!